Designed by Chef Yuzrem Ezri from INTI International College Penang, the mini greenhouse project combines elements of farming and agricultural management, and was first built in INTI International College Penang. The project was then shared with other chefs around the world during Laureate’s Culinary Chef Conference at Panama in May. Today, the project aims to bring the PJS 9 community together to grow locally-fresh and organic herbs, fruits and vegetables that improve access to healthy, home-grown food. Chef Lecturer Eddie Tan from INTI International College Subang further explained that growing your own herbs, fruits and vegetables would ensure a constant supply of fresh, healthy, natural and organic produce. “Growing your own food allows you to use organic methods free from harmful pesticides. On top of eating great-tasting herbs, fruits and vegetables, the residents here can also take comfort in knowing that growing your own food is a sustainable practice. By eliminating the use of pesticides and herbicides, we are also reducing the pollution in the air and water,” said Chef Eddie.Standing at nine feet in height and expanding over 10 feet in width and length, the mini greenhouse was erected in just two days. Built around the concept of the 3Rs of reduce, reuse and recycle, herbs were planted in recycled items such as wooden pallets, drinking cartons, as well as plastic containers and bottles. The herb garden adds basil, mint leaves, parsleys, coriander, rosemary and turmeric to the list of vegetables and fruits such as aubergines, okras, chillies, long beans, angled beans, lemongrass, bananas, papayas and pineapples in the community farm. 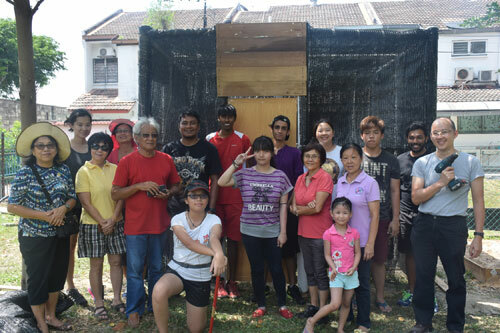 As part of the continuous partnership with the PJS 9 community, INTI plans to organise a Harvest Day Out during the later part of the project to reap the fruits of the community’s labour. Chefs and culinary students from INTI will harvest the crops with the PJS 9 community and design a healthy menu for the residents to enjoy.